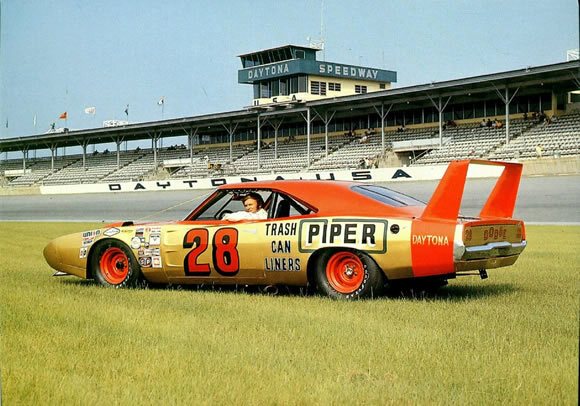 Dodge Chargers are some of the coolest cars ever built especially the 1969 Dodge Charger Daytona Superbird. The front end treatment and the huge rear spoiler make these cars stand out wherever they are. They were very successful in NASCAR but didn't sell so well because the general public thought they were ugly. A top speed record of 200mph was set at Talladega by Buddy Baker in 1970 with the huge wing helping keep the back wheels on the track. It has been said it could have gone a lot faster without the wing but the record still stood for 13 years and was only beaten by 1mph. All supercars have quirks and the Superbird had an excellent one. If you drove it slowly for too long it would overheat. You can imagine the excuse when the cop pulls you over, "Sorry officer. Any slower and it overheats." Wonder it if would have worked. Beautiful, brutal car that I would love in my garage but it probably wouldn't fit.